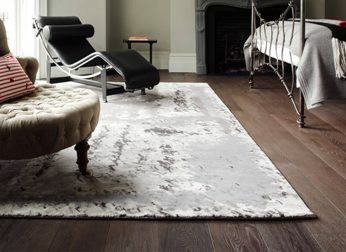 When choosing a rug for your home, one thing to consider is the cleaning aspects of having the rugs. Every type of rug requires different care, so you will need to find out what is best for your particular type of rug. Long- haired rugs are probably the hardest type of rug to clean, and this is mainly due to the long stringy fibres that they have. These fibres are notorious for trapping dirt. Shorter haired rugs are much easier to clean, and you should just be able to take a steam cleaner to them to get them back into pristine shape if they become dirty. It is important to be very careful in how you clean custom made rugs. When you commission a rug, your designer should give you care instructions when you take the rug home. If you are not the first owner of the custom rug, then you probably won’t receive any type of care instructions. These rugs typically have high quality dyes embedded in them, and they are made with fine materials such as silk that will require special care. If you clean these rugs with abrasive cleaners, then you could possibly ruin them. It is best to contact a professional carpet cleaning company, so that they can determine what materials your rug is made from if you aren’t sure. Once they have figured out what they are dealing with, then they should have a good idea of how to clean the rug. All custom rugs should be cleaned with gentle soap solutions in most cases. Maintenance and care of your custom made rugs don’t just involve knowing how to clean them. You also have to care for them properly over time, so that they don’t become damaged. Most homes have a lot of foot traffic, so you will constantly have people walking over them. This could cause tears, fraying, and other problems. Custom made rugs can be really expensive, so you will want to get the damage fixed as soon as possible if you notice something amiss. If your rug does happen to become damaged, then you need to take it back to the designer that you bought it from to be repaired if at all possible. If they are no longer in business, then you will need to find another custom rug maker in your local area to have the repairs made. It is important that you get it fixed by someone who knows what they are doing. Nice tips right here. I have a short haired rug in my home. It doesn't really need to take special care as what you said.